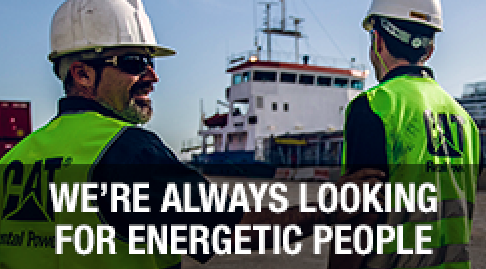 Energyst was formed by Caterpillar and several of its European dealers to be the exclusive CAT dealer in Europe for rental power and temperature control solutions. But most of all: we are a group of people that bring their personal and professional energy to every project in every part of the world. It is not the energy of our rental solutions that makes the difference. It’s the energy of our people. Dedicated experts, who really want to know everything and assume nothing. Only then we can provide solutions that really work, today and tomorrow. For our UK business we are currently recruiting for a Service and Maintenance Engineer to be based from a North Wales Satellite location. Our Service and Maintenance Engineers will be responsible for the diagnosis, service and repair of our Energyst fleet and installation on our customers’ sites to the highest standard guaranteeing customer satisfaction. •	Diagnose, service and repair of TC and Power equipment as required and in line with Energyst guidelines and procedures. Diagnose machine faults using appropriate test equipment and recommend repairs, use Service and Parts information to identify parts and procedures required to complete repairs, complete all required technical reports and other documents. o	on the depot, including project managers, and assist in planning for TC and Power projects. o	to customers on technical and service related aspects of equipment and installations. •	Act on and promote Energyst Health & Safety and Environmental awareness and policy’s; e.g. record all accidents, abuse damages and near misses. •	Determine most cost-effective repair/resolution to minimize customer downtime. •	Promote “Energyst” positively to the customer in a professional manner. •	Be an active member of the engineering team. •	Preparation of reports in line with Energyst internal requirements. •	Committed to work according to company QHSSE guidelines and ensures support on continuous improvement at all applicable areas within the organization. •	Support the 24/7 coverage on an on call rota system. •	Minimum of a 4 year engineering apprenticeship or equivalent. •	Good working experience within the rental market in power generation/ temperature control. •	Good working experience of mechanical and electrical / electronic systems. •	Good knowledge of product range. •	Fully competent on all aspects of diagnosis and repair. •	Good customer care and interface skills. •	Flexible approach to 24/7 business. •	Hold a full and current driving licence. •	Has knowledge of the English language. •	Basic IT competency required. Please send your CV and cover letter to Kirsty.powis@energyst.com. For further information about this job please contact Kirsty Powis, HR & Administration Officer on the mail address.